The climate in Cornwall is perfect for wine growing and our Cornish vineyards produce many award winning tipples. Here are some of our favourite wineries based here in Cornwall. Camel Valley have been producing award-winning, world-class wines in a beautiful corner of Cornwall since 1989. What is it that makes their wines so good? It’s really quite simple – an idyllic setting on sun-drenched slopes near the famous Camel River, excellent grapes that perfectly suit the soil and climate, a respect for traditional vineyard practices combined with a modern approach to wine making and, most importantly, a passion for creating wines that provide pure pleasure. Polgoon is dedicated to producing artisan Cornish ciders, wines and juices on its farm in west Cornwall. You can visit them in Penzance for a vineyard tour and tasting, and take a look at their shop and deli, the perfect place to pick up a picnic of local Cornish produce on your way to The Minack Theatre. Bosue Vineyard is situated just outside St Ewe, about two miles inland from the fishing village of Mevagissey on the south coast of Cornwall. The south facing slopes and mild Cornish climate perfectly suit the varieties of Rondo, Regent, Phoenix and Orion Grapes. There’s been a farm at Bosue for hundreds of years (the name Bosue in Cornish means “house of Ewe” – perhaps refering to the Saint Ewe). Polmassic is thought to be Cornwall’s oldest vineyard, planted in 1978. The current owners have undertaken extensive replanting of new varieties of vines to replace some of the existing “tired” vines, and offer self-guided walks around the vineyard. It has a sheltered and peaceful wine garden which sits amongst the indoor vines where you can enjoy a glass of wine (or two). Light refreshments and cream teas are offered during the summer months, but you are also able to take a picnic and dogs are welcome on leads. 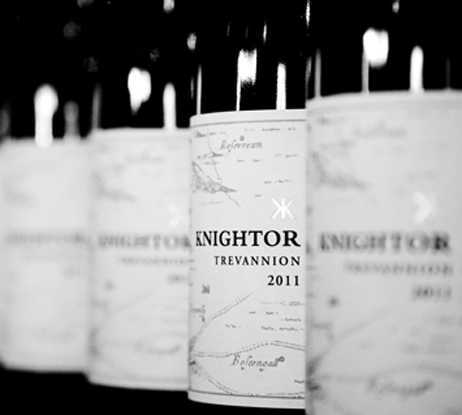 Knightor is both a winery making premium still and sparkling English wines, and a fresh produce restaurant that prepares and serves deliciously tempting menus made using local ingredients. They’re based around a pretty courtyard of granite houses and barns above St Austell Bay. With both accommodation in the manor house and a civil ceremonies license, they can also cater for weddings and private parties. Visitors are equally welcome for just a coffee or a snack, but alternatively, winery tours can be combined with lunch or dinner for a unique experience. Trevibban Mill is a working vineyard close to the north Cornish coast, next to the picturesque fishing village of Padstow. The award-winning vineyard is known for its collection of Cornish wines and cider. At the centre of the vineyard you’ll find the winery, cellar and a stylish tasting room, and you can also enjoy magnificent views of St Issey Valley from the terrace.